ARLINGTON, VA. – March 8, 2018 -- A recent study by the Journal of College Access titled, “Increasing College Access through the Implementation of Naviance: An Exploratory Study,¹” found that using college and career planning platform Naviance by Hobsons is a stronger predictor of college application rates than other factors such as gender, academic achievement (GPA), or socioeconomic status. The study was authored by representatives of the University of Arkansas and the Denton (TX) Independent School District based on Denton ISD’s archived student data. The study explored how Naviance influences high schoolers’ college application rates by pursuing two research questions: (1) Does the length of time students have access to Naviance predict their college application rate?, and (2) Does the number of times students access Naviance predict their college application rate? Results demonstrate the direct effect of Naviance technology on leveling the playing field for all students -- regardless of socioeconomic status -- by increasing access to college and career information in middle and high school, helping students create individualized learning plans, and establishing a college-going culture. “At Hobsons, we believe in helping students explore their strengths, interests, and opportunities that put them on the path to meet their goals. The findings from this independent research demonstrate the direct effect that Naviance has in helping students gain access to college,” said Hobsons CEO Kate Cassino. “As educators seek strategic partners to prepare their students for life after high school, we’re honored to work with more than 13,000 schools and districts across the United States and impact over 10 million students with the resources to realize their full potential." The study examined five variables that were likely to be good predictors of college application rates: gender, socioeconomic status, GPA, number of years of using Naviance, and the average annual logins to Naviance. Findings indicated that the average number of times a student logged into Naviance accounted for the largest variance in the college application rates. Counselors who participated in the study utilized Naviance for an increasing number of tasks including career interest assessments, searching for colleges, creating individualized course plans, and submitting high school transcripts to support their students’ applications. “The Naviance platform has been vital in our mission to empower lifelong learners to be engaged citizens who positively impact their local and global community. The results of this effectiveness study further reinforce our commitment to making college and career readiness - and access to Naviance - a top priority for all our students,” said Denton Independent School District’s Superintendent, Dr. Jamie Wilson. 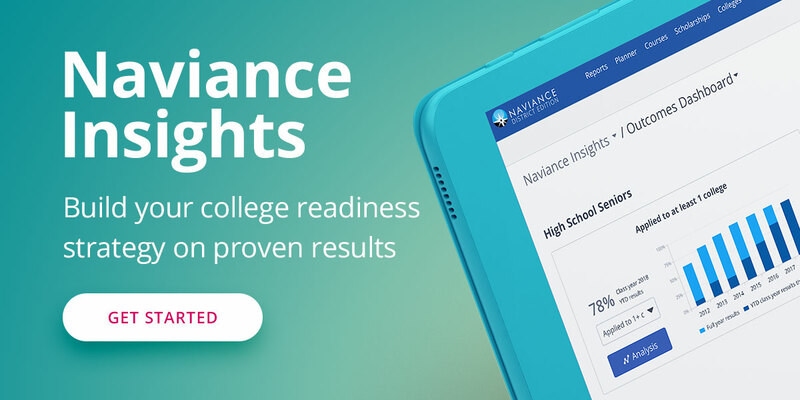 Naviance is the global leader among college and career readiness platforms and is used by 40 percent of students grades five through 12 nationwide. The technology enables districts and schools to align student strengths and interests to their post-secondary goals, improving student outcomes and providing a clear, personalized pathway to success. To download the full report, click here. To learn more about Naviance by Hobsons, visit Naviance.com. ¹Christian, David; Lawrence, Amy; and Dampman, Nicole (2017) "Increasing College Access through the Implementation of Naviance: An Exploratory Study," Journal of College Access: Vol. 3 : Iss. 2, Article 4.